You are currently browsing the archives for the Great ads category. Perez and Ritz Cheese it Up! Need a pick-me-up? In a first-of-its-kind homepage takeover, Ritz Crackerfuls have “Cheesed Up” PerezHilton.com, allowing readers to interact with Perez’s posts in new, odd, cheesy ways. Think Whitney would look more dignified in glasses? Maybe Lady Gaga should be a Viking? Using the palette beside the posts, readers can drag resizable stickers onto any photo. Like PerezHilton.com, Ritz Crackerfuls is a perfect quick, reenergizing, “cheesy” mid-day pick-me-up. …it shows a father using Google products (all accessed through Chrome) to create a scrapbook of his daughter’s early years. Google says it’s based on a true story, although it used actors for the spot. Still, nicely done by Google Creative Lab and Bartle Bogle Hegarty. How many parents of little ones watch this and think they might start writing to their kid(s) via a destination email account? With many computer owners not knowing they are even able to download a new browser for their machines, Google is hoping that the sentimental value of its campaign can increase visibility and ultimately downloads. Google has a winner with it’s current ad for Chrome, as a Dad’s love and pride for his daughter is brilliantly expressed through the thoughtful and personal digital history he creates for her, leveraging Gmail and other Google products from within his Chrome browser. Holy schnikes is this awesome. If you’re a parent, you will not be able to hold it together. Fine, fine stuff from Google. And that closing line, “the web is what you make of it” is terrific. But little is being said about all the layers of technology between us and Baby Sophie. Clair Caine Miller of the New York Times reports that this is part of Google’s “the Web is what you make of it” campaign. But in this day of techno-ubiquity, doesn’t this prove that we are what the Web makes of us? Advertisers continue to start their own Twitter trends with Blogads new “Tweet This” feature, which allows readers to update their Twitter status directly from the ad. Ready to get your ad’s tweet on? Build your own tweetable ad with our DIY system now! Last month, the SUXORZ panel had some fun with Denny’s at Social Media Week. Denny’s, trying to get into the “Social Media” game, had printed the wrong Twitter address on its menus, sending customers to the page of a random guy in Tawain named Dennys. It was an honest mistake. 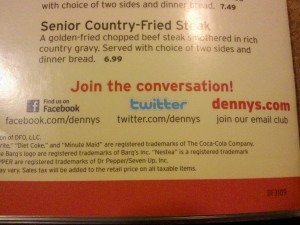 After all, Denny’s owns “Dennys” on Facebook and YouTube, and Dennys.com, so why wouldn’t they own the Twitter handle? In the videos, SNL alum David Koechner has extremely casual conversations with his comedian friends at a real-life Denny’s in L.A. The first two episodes have featured Sarah Silverman and Jason Bateman, whose production company, DumbDumb, co-created the series with Electus and NY agency Gotham. The spots really emphasize the comfort you feel in America’s Diner, where you can sit with a friend and be completely open — all night. Distributed via College Humor, as well as Denny’s own social media pages, the spots, which are set to feature Will Arnett, Amy Poehler, and more, are getting lots of admiration from the ad industry. Great database of old advertising. Ads are the economy’s diary. And speaking of advertising, Time Out New York now has ads on our New York blogs. This is our first metro-specific order. Expect lots more.